Members of Hastings and Rye Green Party display their banner in Alexandra Park (photo: HGP). The ‘Bridges not Walls’ movement was initiated by Will Stevens of Hastings – better known to locals as mobile ice cream seller William the Cone-Queror. It sparked a ready response among those disgusted with Donald Trump’s campaign rhetoric of hatred, lies, misogynism and racism. In answer to the call to “…create a loud, clear and colourful cry for the universal values of peace, respect, equality, and justice,” some 250 actions were carried out over the world, the majority in the UK. 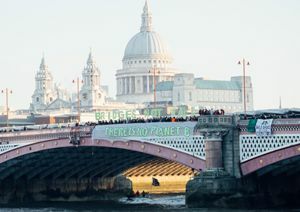 London’s bridges, including Blackfriars, attracted a host of banners (photo: Bridges Not Walls). 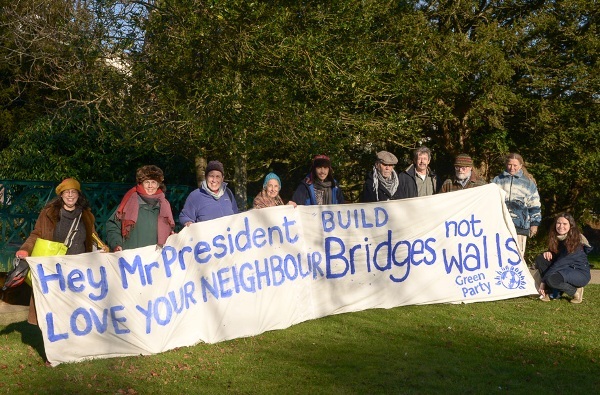 Among those who took to the bridges to declare their opposition to Trump politics were members of Hastings and Rye Green Party (HGP), who displayed a banner proclaiming, “Hey, Mr President, love your neighbour, build bridges not walls” in Alexandra Park and on the crazy golf course on the sea front. Over the UK as a whole some 150 banner drops took place, as well as in many other countries, including Ireland, Germany, Italy, Norway, Ethiopia, Cambodia, Australia, New Zealand and the US. And on the day after the inauguration, the women’s march on Washington, another action of repudiation of the new president, is estimated to have attracted more participants than those who attended the inauguration.